A visit to the dentist hasn’t been my best thing! I guess it’s the only doctor which gives me the creeps, and apparently many other people feel the same way. So what if someone was to tell you that the feeling would change as the dentists office would look more like a Zen retreat than a dentist’s surgery? 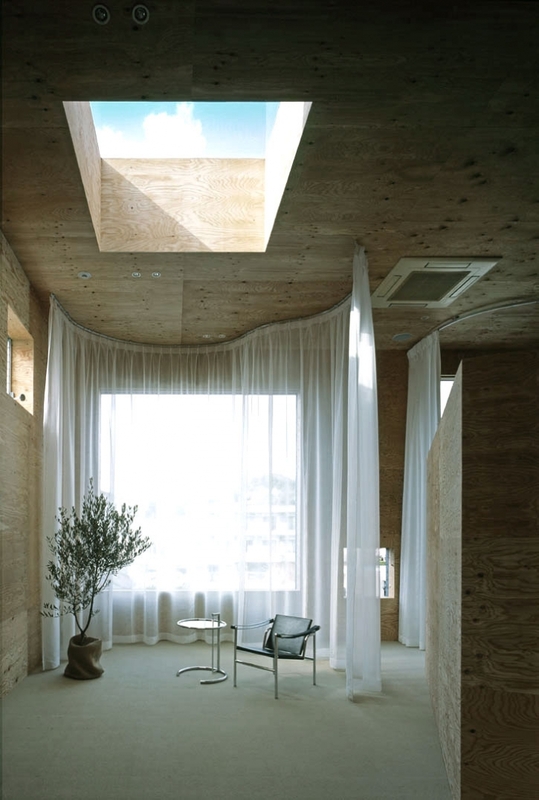 Keisuke Maeda of UID Architects, designed a building for a multi-tenant project in Fukuyama // Hiroshima. Maeda used a somewhat unconventional approach to his design of this multi-tenant building as he and his clients tried to rethink and evaluate the possibilities of a multi-tenant building that would symbolize an “appealing contemporary philosophy while taking into account such routine considerations.” Usually, such projects and the offices which design them place their entire emphasis on profit maximization and the optimization of the floor area. 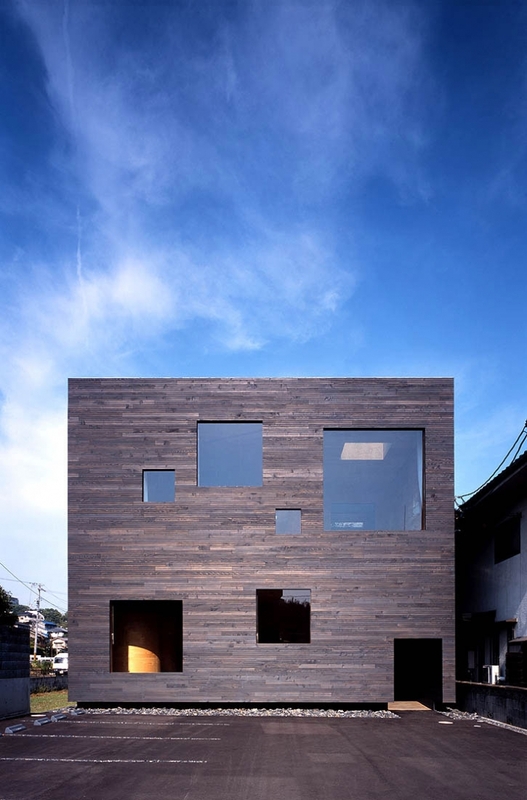 Maeda believes that such projects and their architecture often incorporate superficial elements. 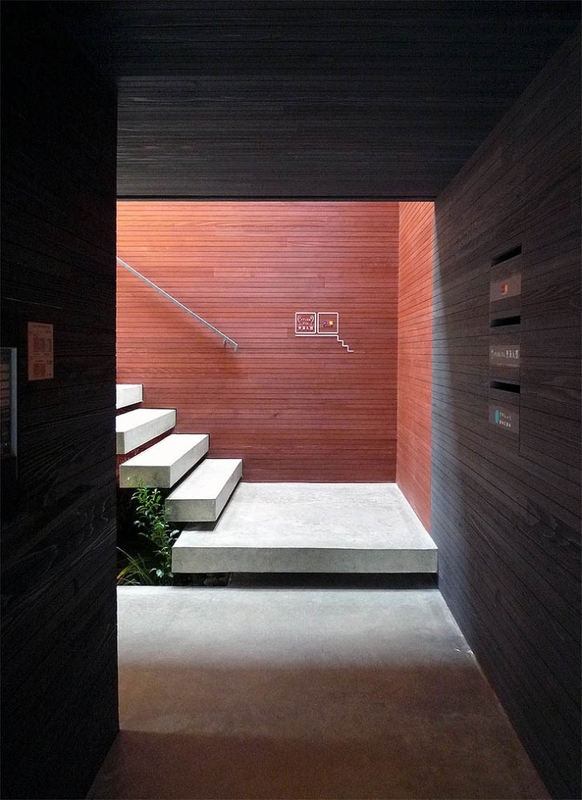 With a long and narrow plot, which is surrounded on all three sides by neighboring houses Maeda embedded a steel structure while the building’s cedar-clad plywood shell neatly encloses the premises of the dental clinic, a beauty salon and UID’s Architectural office. The dental clinic is located on the first floor while the beauty salon and the architectural office are on the second floor; truly a mixed-program regarding the businesses in the multi-tenant building. 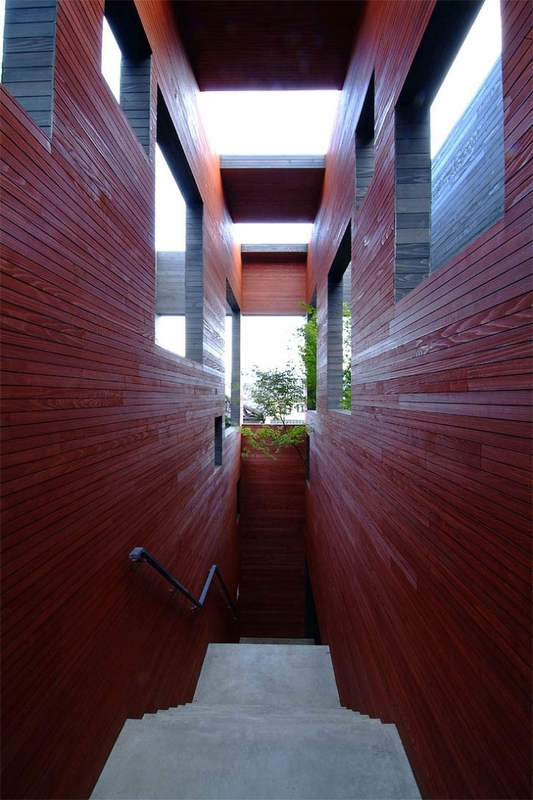 In an attempt or rather a challenge to give as much value to the interior spaces as to the street frontage, Maeda designed two boxes which are oriented toward the east and the west, while a third box in the middle includes a staircase and a forest. The sequence of four walls which are formed by the layout of the boxes was designed to create a sense of integrated diversity in the architecture as a consequence of the layered openings between the boxes. 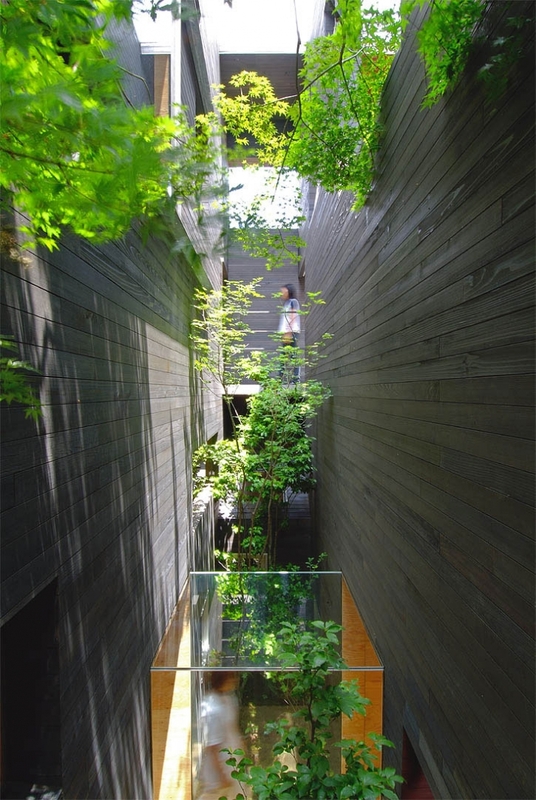 The porous walls which progress from the street to the back of the plot create a small forest in the buildings void. 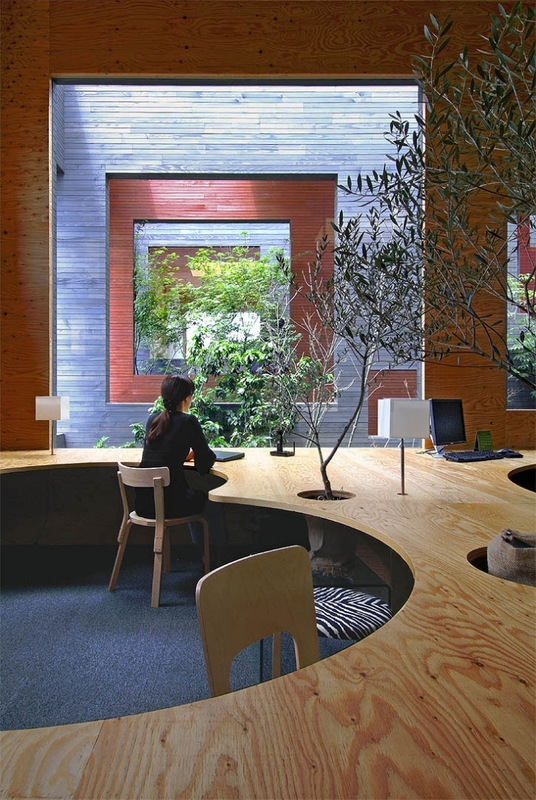 With this design approach Maeda has minimized the transition of the interior and the exterior as he has brought exterior elements into the interior. With an objective to create a vague distance Maeda wanted to create an environment which would spread out in an organic matter. The tenants were actively involved in the design and decision-making process of the building from the planning stage to the interior design. As they understood the framework of the building, they all took a practical approach in deciding how the interior spaces would be designed. Each of the spaces is separated by a slender plywood screen while the window openings ensure privacy by the way they are positioned. When the building is viewed from the exterior the varied positioning of the window openings on the façade creates a pattern as if you’re expecting to see the square opening in the box building. The occasional alignment of the windows throughout the different layers of the box construction allows for ample of natural light to surpass the building although it is constructed in a long and narrow plot with neighbors on all three sides. 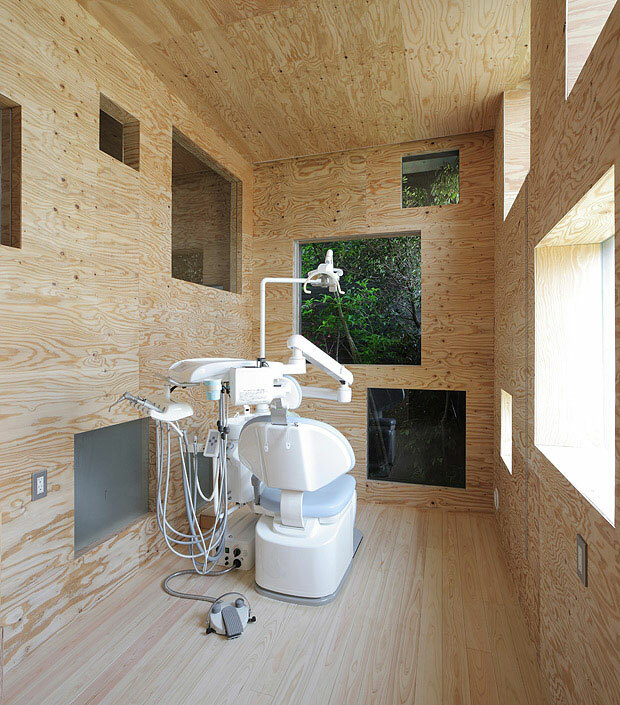 Undoubtedly, any future visits to the dentist for the residents of Fukuyama will be in a harmonious Zen environment. The sound of the drill may not sound as freaky as it used to if you are lying on the dentists chair and enjoying this magnificent scenery which very much reminds us as if you are in a tree house overlooking a forest through the square windows. 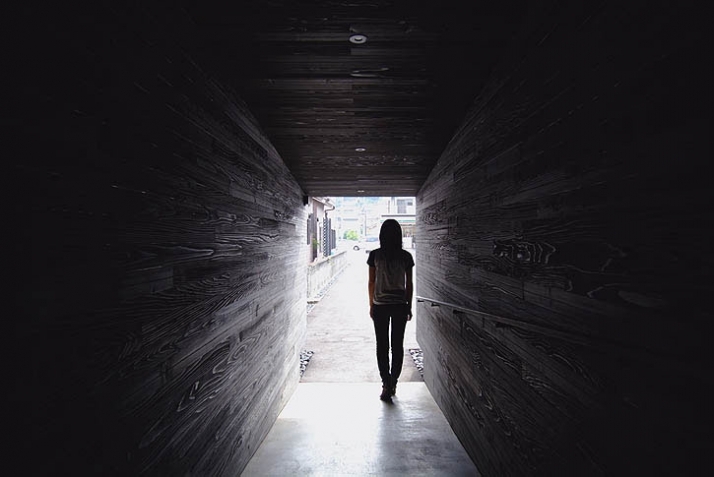 The application of the cedar plywood walls creates a feeling of serenity and calmness more than the white walls of a usual dentist’s office which are said to be relaxing.